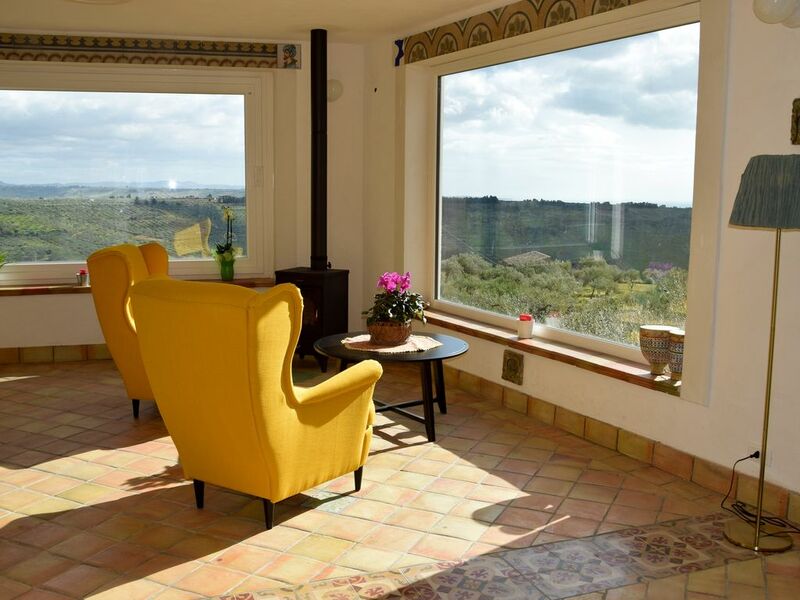 a delightful new house in the Sicilian companion, immersed in a private olive grove with sea views and private parking. The interior is completely furnished, so the furnishings are new, including the bathroom and the kitchen. The kitchen is in masonry with an electric oven, a wood-burning oven for pizzas and a wood-burning stove. The external façade has not yet been painted and there are no external finishes, such as the external paving, the paths between the olive trees, etc., but in any case the external space is completely accessible. The beaches are just a few minutes (about 2 km and a half) and the center of Sciacca is 10 minutes away by car. The city of Agrigento with its temples is 60 km and half an hour by car are the archaeological sites of Segesta and Selinunte. È un immenso piacere leggere le tue parole e sapere che vi siete trovati cosí bene, speriamo davvero di riospitarvi presto!! Siete una famiglia simpaticissima che ha rispettato la casa lasciandola come pulitissima ed in ordine. We really enjoyed our stay in the nice house. The accomodation is super cozy and there is a lot of space to do whatever you want. :-) We found everything in the kitchen that we needed. I couldn't believe that you have such a gigantic view through the huge windows. The owner and his family were really nice! We are very glad to hear that you enjoy your holiday at our place!!! we're looking forward to see you again, if you'd like came back in Sicily! Innen entspricht das Haus den Fotos in der Anzeige. Von außen betrachtet ist das Haus bestenfalls als Baustelle zu bezeichnen. Es gibt keine Möglichkeit, draußen zu sitzen, keine Terrasse o.ä. Wir waren im März dort, es war nachts unter 10 Grad. Der kleine Holzofen wärmte nur im unmittelbaren Umkreis von einem Meter, die Heizlüfter neben den Betten funktionieren zwar, bringen aber auch nur minimale Wärme. Zudem fällt bei gleichzeitigem Betrieb der Lüfter die Sicherung heraus. Innen war es klamm und kalt, eine Temperatur von unter 10 Grad. Ein Aufenthalt war nicht möglich. Die Aussicht ist wunderbar, leider war nur eines der großen Fenster geputzt. why such a lot of lies??????? you KNOW that the exterior of the house was unfinished (I told you about that by whatsapp, and in the web site is written clearly). But it is NOT a construction site. The window was not perfectly clean because during the night it was raining ( a rain full of desert sand as often happen in that period). It was cold iside, yes, that's true. But we wasn't already prepared to rent the haiuse in winter, and we told you that there is only a wooden stove in the house. You should avoid to write a such a bad review only for this! Concerning the electricity, it's obvious that if you switch on too much domestic appliances, the electricity fall down and you remain on the dark! It happen in all the houses.